Translate This Button: the 15 minute module that will open up your world. 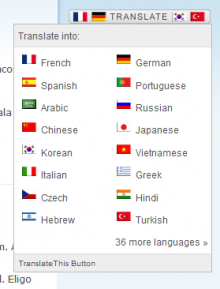 I just translated my entire site into 36 languages. It took maybe 15 minutes, might take the novice a half hour, and is probably the best half hour you will ever spend on your site. A drupal module that combines the amazing power of Google Translate with the ineffable coolness of drupal called Translate This Button is well worth it's weight in computational space. Imagine what would be possible if the little boys trying to hack your site in the Philippines could actually understand it. English readers only make up a small percentage of the worlds internet users. This module will literally open up your world to audiences you never dreamed you could have access to. In less than a half hour. Here's the instructions: 1. Load the module folder into the /site/all/modules folder or the /site/default/modules folder on your server. 2. Enable the module in drupal. 3. Got to the Blocks page in drupal and put the “'Translate This Button” block in a section of your site. What used to take multiple translation teams, and hundreds of people-hours depending on how large your site is, I can now accomplish in less than 15 minutes if the site is set up well. This module could have been installed in the time it's taken you to read this blog. Stop procrastinating and go do it now.